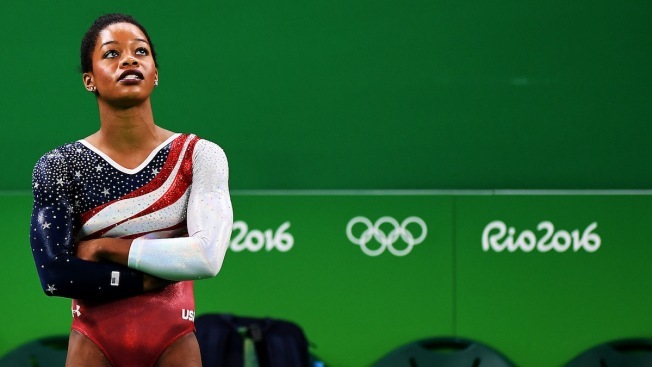 In this file photo, U.S. gymnast Gabrielle Douglas watches a teammate compete at the 2016 Rio Olympic Games on Aug. 9, 2016. Olympic gold medalist Gabby Douglas revealed in an Instagram post on Tuesday that she was abused by former team doctor Larry Nassar, who is expected to plead guilty to criminal charges on Wednesday, NBC News reported. The disclosure came in a new apology for a tweet last week in which Douglas said, in a response to Aly Raisman talking about sexual abuse victims, that women have a responsibility to dress modestly because "dressing in a provocative/sexual way entices the wrong crowd." She later apologized on Twitter. "I didn't view my comments as victim shaming because I know that no matter what you wear, it NEVER gives anyone the right to harass or abuse you," she wrote in her Instagram statement. A representative for the Olympian confirmed the authenticity of the post and that Douglas says she was molested by Nassar, who was first publicly accused of preying on athletes more than a year ago. In her post, Douglas explained why she had not joined the other accusers until now.